Ways We Can Work Together! Learning the language of energy opens the gateway to happiness and harmony. It is the foundation of trust and self-confidence. You define the direction of your life with the choices you make and the actions you take. In this session you’ll also discover the the touchstone to help you focus and re-energize. Define Your Goals; Map Your Success! The GEMS™ program takes you through a personalized review of what it takes to manifest your inspiration. Access the gifts of mother earth to focus your energy and more! You know it’s time for change. You’re looking for clarity. You’re ready to dive in, prioritize , make a plan and take action. This is a customized 1/2- 2 day session which supports a thorough review of your goals and energy blueprint. You’ll decide what’s working, what’s not and specific steps to manifest the your dreams. Gemstones are woven into the history of cultures around the globe. Revered for their beauty; given as tokens of affection, used in healing and energize the age of technology. Crystals have an essential role in modern day living. 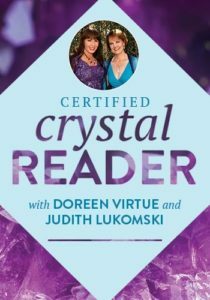 Doreen Virtue and I have teamed up again to bring you a an amazing course on crystal energy and how to use it in your life! You’ll learn how to add gemstone energies to your life to help with: stress, health, relationships and more! Support your journey with a curated collection of tools for transformation: Books and CD’s, Personalized Stone Selection, Crystal Therapy Grid Kits and more!